A new generation of small, smart, versatile robotic landers will aid in the exploration of airless bodies such as the moon and asteroids. The design is based on cutting-edge technology, which allows precision landing in high-risk but high-priority areas. This technology enables NASA to achieve scientific and exploration goals in previously unexplored locations. •	Math and Science @ Work: Lunar Surface Instrumentation module. •	Lunar Nautics: Designing a Mission to Live and Work on the Moon. Connections like this will help your students see that the things they learn in school have a real-world connection to what is happening at NASA right now! Read more about this exciting new prototype in the NASA Explorer Schools NEON forums Math and Science @ Work: Lunar Surface Instrumentation module and Lunar Nautics: Designing a Mission to Live and Work on the Moon. Are you looking for an extension for the Lunar Surface Instrumentation Content Module on the NASA Explorer Schools Virtual Campus? Bring current NASA discoveries into your classroom with this article! State-of-the-art seismological techniques applied to Apollo-era data suggest our moon has a core similar to Earth’s. 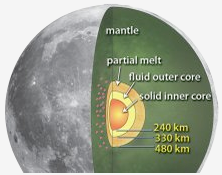 This new discovery tells us that the moon may have created and maintained its own strong magnetic field at one point. The study details how the seismological instruments used for lunar exploration have unveiled new information regarding the moon’s core. Read more about this exciting new finding in the NES Math and Science @ Work – Lunar Surface Instrumentation forum in NEON. Register, log in, join the NASA Explorer Schools group and find the forum. The complete write-up on this discovery is available there.